Last night was the fewest passes per shot since Gregg Berhalter took control of the team. It's been coming, though. 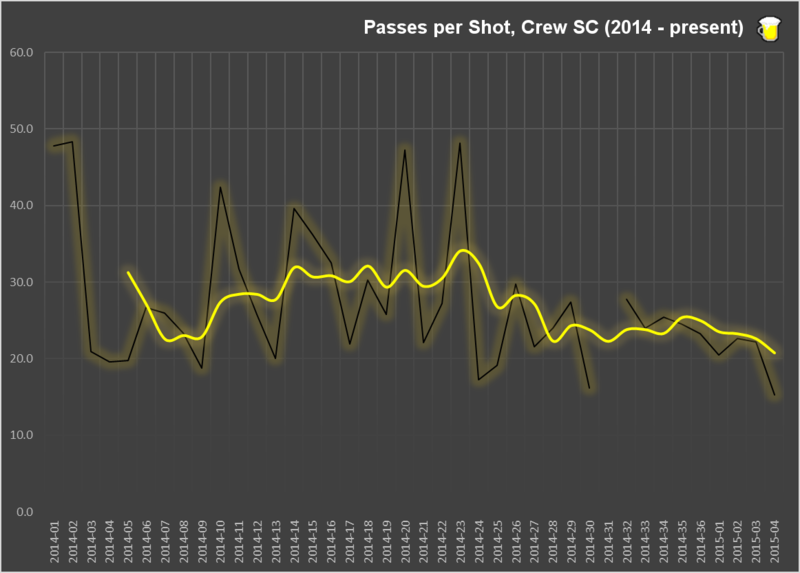 I took a look at last year and Crew SC finished up the year at around 27 passes for every shot taken (6th in the league). This year it's around 20 (2nd to last). This top chart shows game by game how many passes Crew SC make before taking a shot. The yellow line is a five game rolling average, to smooth it out. The black line in the background is game by game. Note that after Round 24 last year (2014-24) there was a change in approach to attacking play. The exception is clearly Round 31. That happens to be when the Crew SC took on a motivated and hyperactive Jermaine Jones. Crew SC only got off 8 total shots that night. The 2nd graph (below) paints a little bit of a better picture. Taking out the wacky Super Jermaine Rd 31 match tells us that Berhalter has tinkered a bit with how quickly shots are taken. You can see that there was some consideration to the opponent last year and no doubt that some of that was do to opposing coaches not being familiar to what Crew SC are trying to do. I don't believe there is any right or wrong way to play things here. Making less passes before taking a shot pushed Columbus into 3rd place going into the playoffs last year. With that, however, the Crew have played a number of stinkers since the made those playoffs last year... Two games against New England, the NY game at home this year and arguably a 'just survive' game last night against Vancouver. Columbus has been known as a tight, possession based team since the beginning of last year. There are a few other things that point to Crew SC going more direct but I think this one is the most descriptive. I will say that all of last year Columbus dictated the play through possession, while over the past ten games or so, that's not the case. Through circumstance or necessity, the shape of things are changing. It'll take a few more games to be able really tell if things have changed. Suspensions (Federico Higuain) and injury (Wil Trapp) are part of the deal. Every team has to deal with those things. Perhaps Columbus got a tad lucky last year on both fronts? We'll know here soon if that's the case.